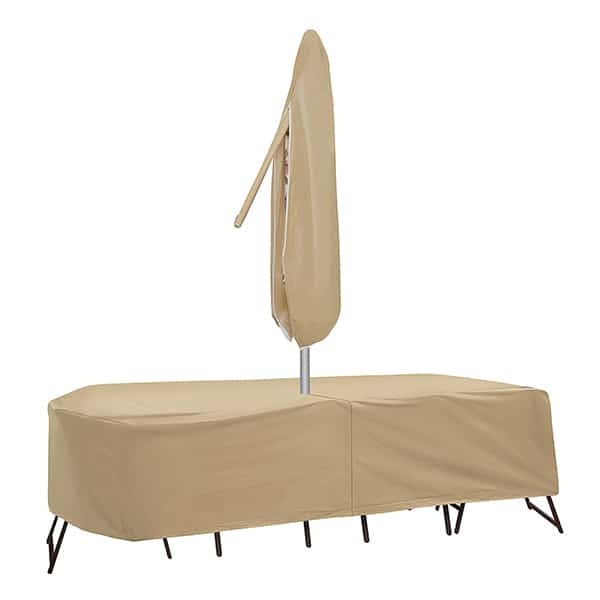 Protective Covers Inc. delivers a much-needed innovation to the outdoor furniture protection marketplace. Gone are the days of fuzzy backed vinyl coverings that fuzz and flake off and deteriorate with years of use. PCI has incorporated new technology and components into their recipe for the Dura-Gard HD vinyl coverings. Dura-Gard vinyl uses exclusive polypropylene backing made by PCI. The polypropylene is compressed into a flat sheet of material and then laminated directly onto the vinyl fronting. This creates a two-layer protection around furniture, whether for nighttime storage or winterization for an entire season. This version of the 60’’ – 66’’ Oval and Rectangle High Back Chair Set features an umbrella hole and is made for easy application and removal. Thus, if you’re planning to protect your furniture for short periods of time in order to keep it absolutely pristine from year to year, this set is your best bet.